Adam and I decided pretty early on that we preferred to receive gifts that were experiences rather than things. And this Christmas was no exception. When we opened our gifts we realized we really were two peas in a pod when we both got each other gifts to visit a National Park! Adam's gift to me will be in May to Yellowstone National Park. 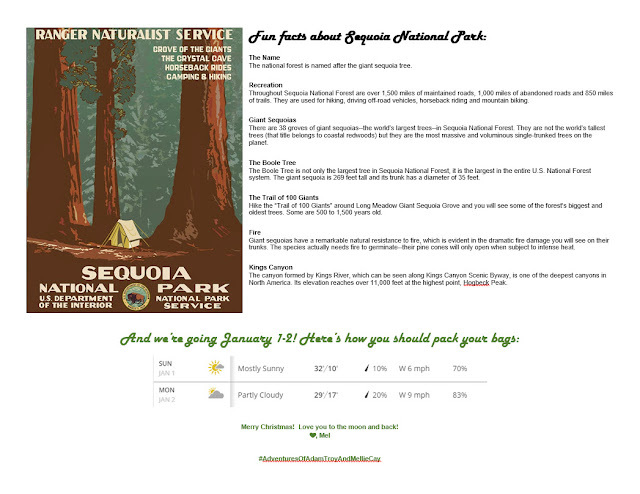 His gift from me was a trip to Sequoia National Park for New Year's Day. Coupled with this Osprey Backpack and snow cleats (which btw, are amazing! Definitely recommend them for easy to medium hikes in the snow/ice). We got off to a late start since we were out late for New Year's Eve and got side tracked on the road at the outlets. But finally made it to the park around 3pm. We didn't have much time before sunset, so we headed straight to the Giant Forest Museum. The Sentinel is an "average" sized tree, but is still about 27,900 cubic feet (790 m³) in volume. Then we headed back to our hotel room. We love to camp, but we definitely recommend renting a hotel room if you plan to travel in the winter. We are slowly acquiring "real" camping gear, but we aren't quite equipped for winter camping yet. We stayed at the Comfort Inn in Three Rivers. Without traffic it's about a 15 min drive to the park entrance; it takes about 1-1.5 hours to get to the Giant Forest from the hotel. Our stay was very affordable (under $100/night), our room was clean, and it included a pretty delicious continental breakfast (we are suckers for make your own Belgian waffle). As someone who used to be pretty picky about hotels, I am finding that inns are very comparable and much more affordable. We also learned more about General Sherman, which by volume, it is the largest known living single stem tree on Earth. It stands 275 feet (83 m) tall, and is over 36 feet (11 m) in diameter at the base. General Sherman is over 2,200 years old.